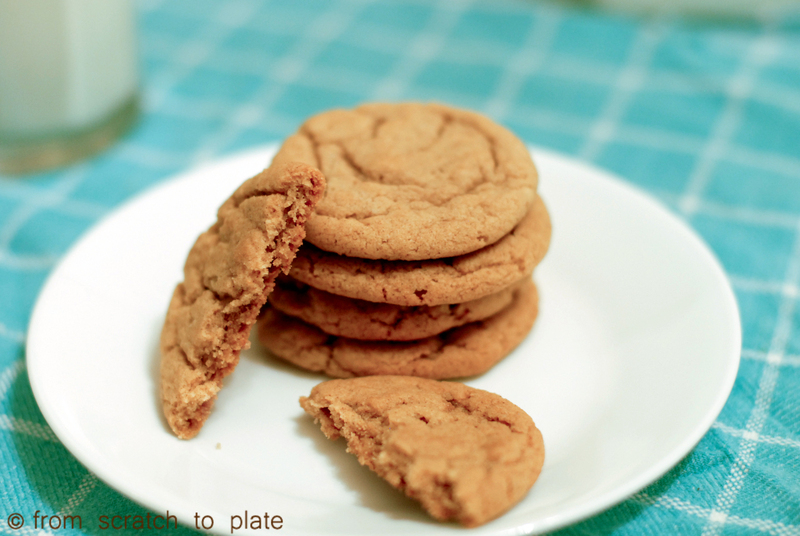 So, I was recently told by a friend that I didn’t have any cookie recipes on my blog. What?!? She’s craaaaazzzzyyyy… when I was a teenager, the one thing I always made while I fantasized about being on my own cooking show was cookies. Then I checked. Seriously? How has my blog survived for this long without a cookie recipe? Sheesh! 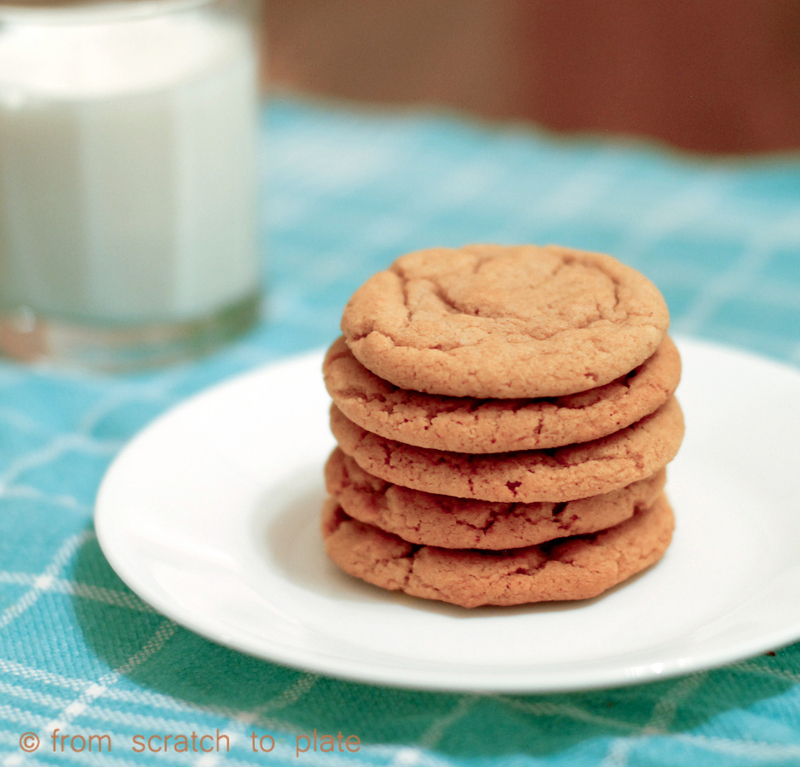 So, here are some IMPORTANT tips about making cookies. Seriously. Learn them. Love them. Live them. Rule #2: In all baking recipes that call for butter, what they mean is UNSALTED butter, unless designated. Personally, I almost always use salted, then cut the salt measurement in half. In my recipes, I tend to note salted butter, because I’m a rebel. Rule #3: Okay, another one about butter…the butter should be room temp. It should be soft, but not melty. I take my butter out of the fridge about 30 minutes before making cookies. You can take your eggs out at the same time, as I have read countless remarks by professional bakers that eggs should always be room temp (though I have made thousands of cookies with cold eggs in my lifetime that were pretty dang good). You should be able to press into the butter easily, but it should not completely collapse or fall apart when you touch it. If you HAVE TO use the micro, zap it for 6 seconds or so, then whip it with your mixer until it’s smooth and has no lumps before adding your sugar. Rule #4: MIXING: This is KEY to tender cookies. When mixing in the dry ingredients (quick lesson on cookie making: it will almost always go like this: Beat together sugar and butter, add egg and vanilla, mix in “dry” ingredients, then fold in chunks). DO NOT over mix. (YES, I realize that I MAY be overUSING my caps button…But these things are IMPORTANT! I take cookie baking VERY seriously). For perfect cookies that aren’t tough, mix dry ingredients just until the flour almost disappears…so you still see some remnants of flour (not big chunks, but sprinkling throughout) in your dough. Stop mixing (especially if you are using a stand or hand mixer). Now is when you add your chunks: fruit, chocolate chips, nuts (heaven forbid…nuts do not belong in cookies, you crazy person). Then finish the mixing BY HAND. Do not overmix the dough. Rule #5: Pull the cookies out when the outside is cooked, but the inside is still moist. They will still be cooking when you pull them out of the oven, and will finish cooking as they cool. I posted pictures on this. You should still be able to see a glistening of moisture in the cracks, but the outside is cooked and the edges are firm. 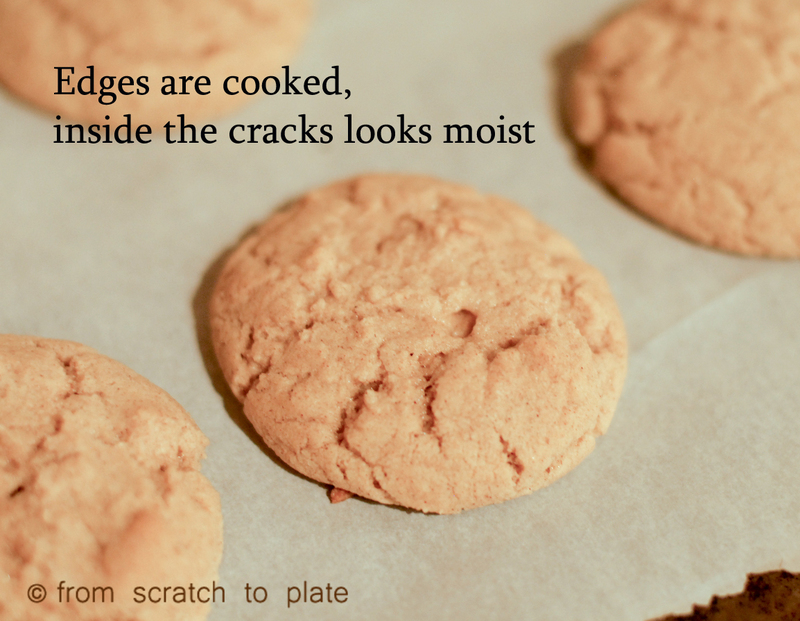 If you are a novice to cookie baking, this takes some observation and practice. Pretty soon, you’ll know exactly how they should look when it’s time to take them out. Rule #6: This is a bonus baking rule that popped into my mind while writing the above rule. The time given in a recipe is an ESTIMATE. Everyone’s oven is different, everyone lives in a different climate (well, except for those who live in the same climate as you, you know what I mean…), the ingredient measurements will vary slightly, different pans cook differently, etc. You should use the time as a guideline, but your nose and your eyes, and sometimes your hands, have the final say on when something is done. I always trust my nose. As soon as I start to smell whatever I’m baking, I go check on it. If you’re making a cake or quick bread, use a knife or wooden skewer or toothpick to see if the inside is done. For cookies, start checking 2 minutes before the designated time. so, for these cookies, start checking at 8 minutes. They could go as long as 12 minutes, depending on your oven, etc. These are a crowd pleaser. They are something different when you don’t have chocolate chips and aren’t in the mood for peanut butter cookies or snickerdoodles. They are crisp on the outside and perfectly chewy on the inside and have just the right amount of spice and sweetness. They are perfect with a tall glass of cold milk. (But, who am I kidding, aren’t all cookies)? Preheat oven to 350 degrees. In a stand mixer, beat your butter and sugar for 3 minutes until it’s fluffy. Add the egg, vanilla and molasses and mix well. Add in your flour, baking soda, cinnamon and ginger. Mix only until the flour is mostly incorporated. 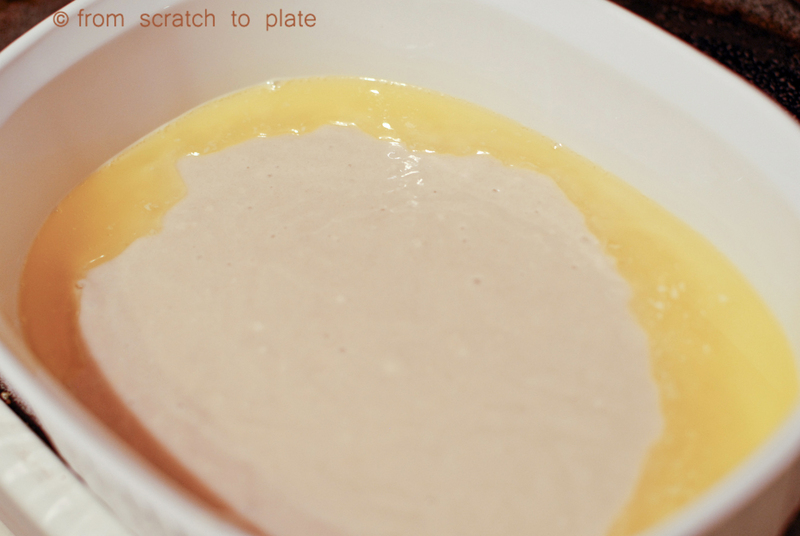 Finish the mixing by hand, and stop immediately when the flour disappears. 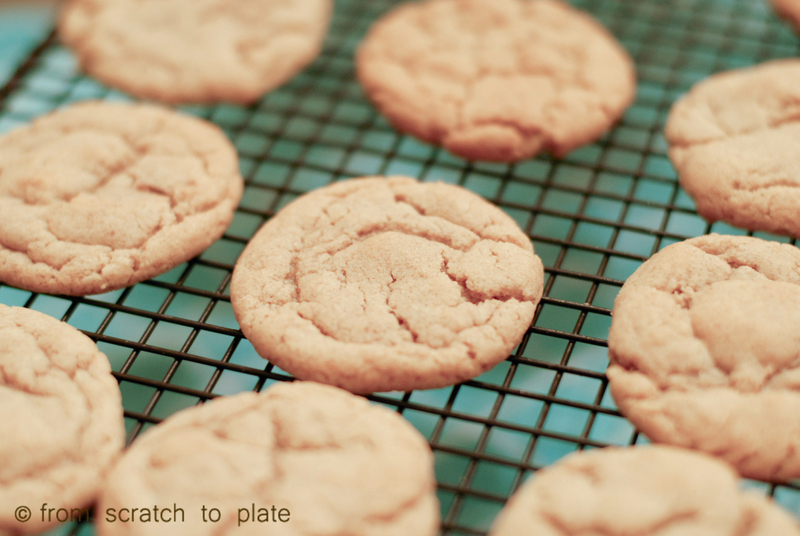 Drop by heaping spoonfuls on a foil- or parchment-covered baking sheet. Bake in preheated oven for 10 minutes. Cool on a cooling rack. Ahhhh…Cream of Whatever soup…when you hear this, does it bring to mind thick, gelatinous condensed soups from a can? My mom was masterful with condensed soup. So was I: give me a miniscule grocery budget and some condensed soup, and I can perform miracles. That changed 6 years ago when we stopped eating soy and processed foods (read that story here). 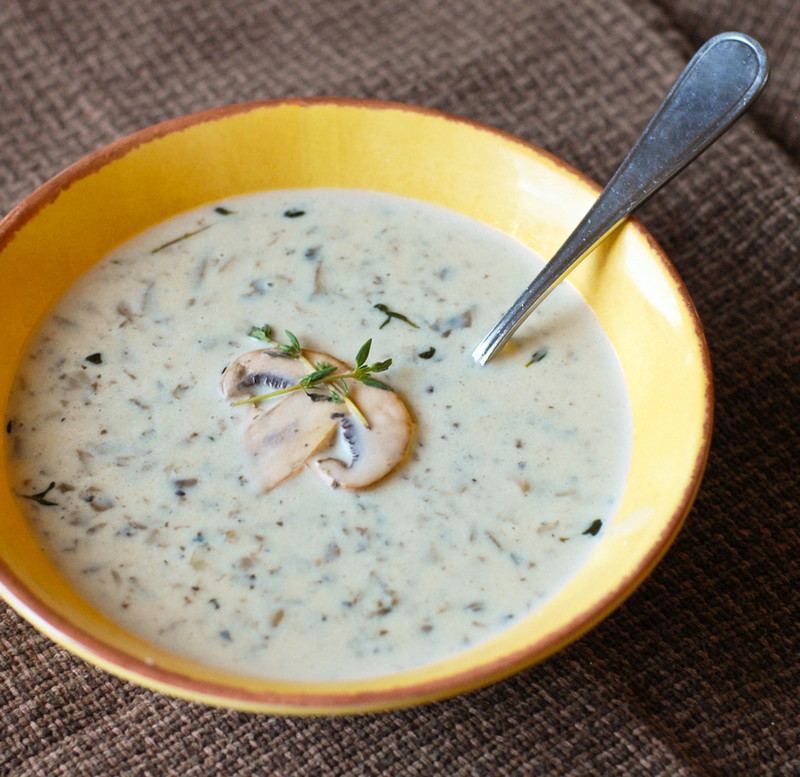 In college one of my favorite meals was cream of mushroom soup, from a can, condensed, with added water. It turns my stomach to think of it now. 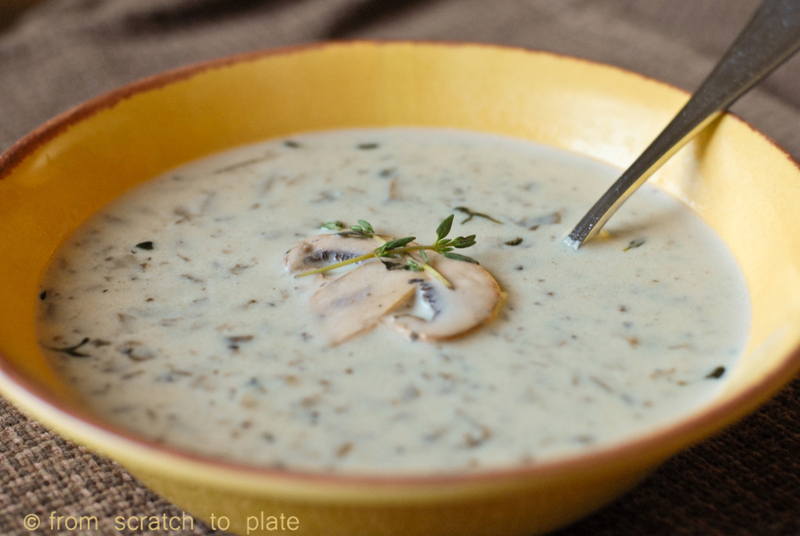 But, I still love an earthy, creamy Cream of Mushroom Soup. So, I set out to make one from scratch. I was a little wary, because I have two kids who don’t like mushrooms. One hates them. I was amazed when my mushroom hater asked for his third helping. (This is also my super-picky eater who loves nothing and strongly dislikes soup of all kinds). Every person in my family declared this one “a keeper”! Prep: Chop mushrooms up finely. Dice your onion. 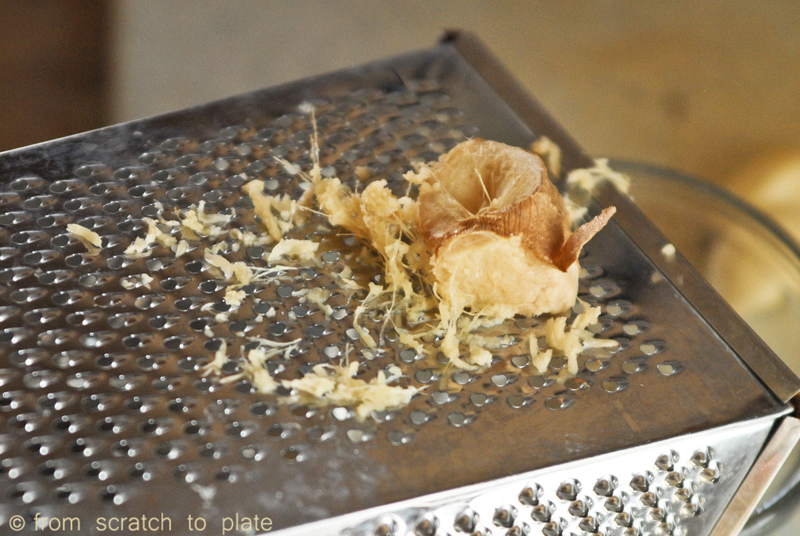 Mince or press your garlic. Remove thyme from stems and measure out 2 TBS worth. In a pot, heat olive oil and butter over medium heat. Add onion and cook until soft. Add garlic and thyme and cook an additional minute. Add mushrooms and worcestershire. Cook, stirring occasionally about 5 minutes, until much of the moisture from the mushrooms (say that 10 times fast) has come out into the pan. Add the chicken stock and bring to a boil. Combine cornstarch and water and add it to the pot. Cook, stirring, until mixture becomes slightly thick. Add cream and milk and heat through. Salt and pepper each bowl to taste. REAL food alert: check your worcestershire sauce for additives. The only brand I found with no additives was Lea & Perrins (the kind in the ostentatious paper wrapper). Check your chicken stock for msg and other additives. Check your cream for additives. ALLERGY alert: worcestershire contains anchovies. You can just leave it out if you have a fish allergy. To make this dairy-free, substitute a plain alternative milk for the milk and cream. Plain almond milk would be a good flavor match. If it isn’t thick enough, you can add more cornstarch/water at the end, just be sure the soup is very hot when you add the cornstarch in or you may get lumps. Also, use all olive oil and leave out the butter. VEGGIE alert: to make this vegetarian, sub veggie stock for the chicken stock. To make it vegan, see the dairy subs above. When I was a little girl, growing up in Iowa, I would sometimes be lucky enough to spend a few days at a friend’s house who lived “in the country”. We’d stay up late playing barbies in her basement, and the next day, grab some bikes and ride down to the DQ for drippy ice cream cones that melted faster than we could lick in the hot, humid, midwestern air. Every once in a while, on family night, my family would drive down to the local DQ and get “belly-buttons” as a treat. Dilly bars no longer have the curlicue in the middle that made them look like an “outie” belly-button. Now they’re just a circle on a stick. Sad, really. Now, I live in a semi-rural suburb, where one of the only “fast-food” places nearby is a DQ. Many traditions now revolve around the DQ: first day of school, last day of school, birthdays, etc. typically involve a trip to the DQ for drippy ice cream cones that melt faster than we can lick in the hot, dry, southwestern air. I still love a “crunch” covered cone, and occasionally a butterscotch dipped. But, when it comes to blizzards, my favorite is the “chocolate covered cherry” blizzard. Vanilla soft-serve mixed with cherries and chocolate coating. It’s just darn tasty! A week ago, we had an exciting delivery: AN ICE CREAM MAKER. We actually have one already, it’s one of those huge old fashioned types that require ice and rock salt. I have to admit, the old clunkers do a much better job making tasty rich ice cream. But, I wanted one of the new-fangled speedy ones that make a batch in 20 minutes (of course, that’s not accounting for the time to freeze the bowl, make the mix and chill the mix…it’s still a half-day affair, but still beats having to watch and add rock salt every little while). 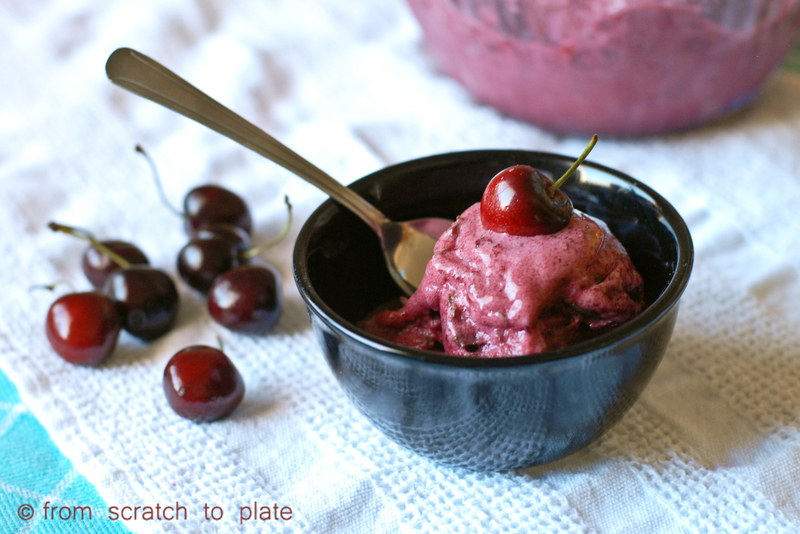 This recipe I devised after seeing fresh cherries on sale and reminiscing about DQ. It’s a sorbet made from fresh cherries, with chocolate flakes throughout. It’s very tasty and a perfect summer treat. Rinse and remove stems and pits from cherries. Place in a pot with the sugar, water and lemon juice. Bring to a boil over medium heat. Lower heat and simmer for 10 minutes. 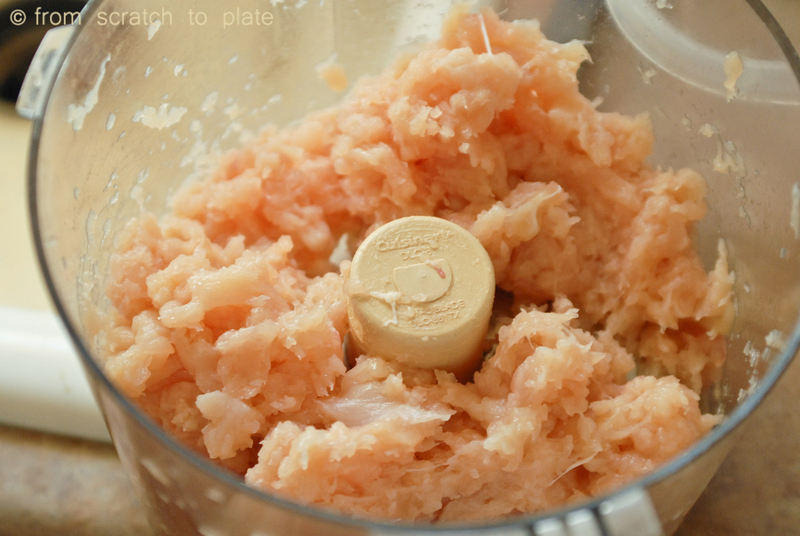 Place in a blender or food processor and puree. 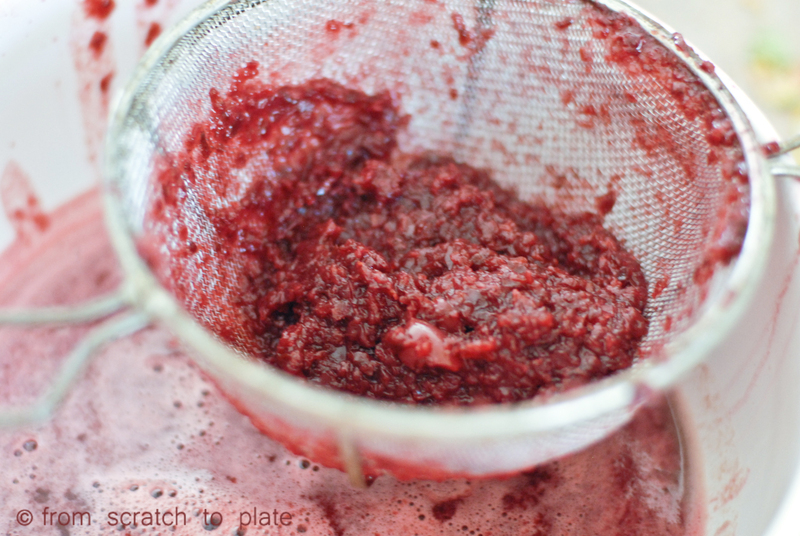 Pour mixture through a fine-mesh strainer into a large bowl, use a rubber scraper to push as much juice out as possible. At this point, you can add some of the pulp back in, depending if you want a smooth sorbet, or small bits of cherry pulp in it. I scooped two spoonfuls of pulp back into the juice and discarded the rest. You can skip the straining altogether (just watch out for hiding pits), or just use the juice for your sorbet. Add the almond extract to the juice. Cover and refrigerate at least 2 hours before putting into your ice cream maker. 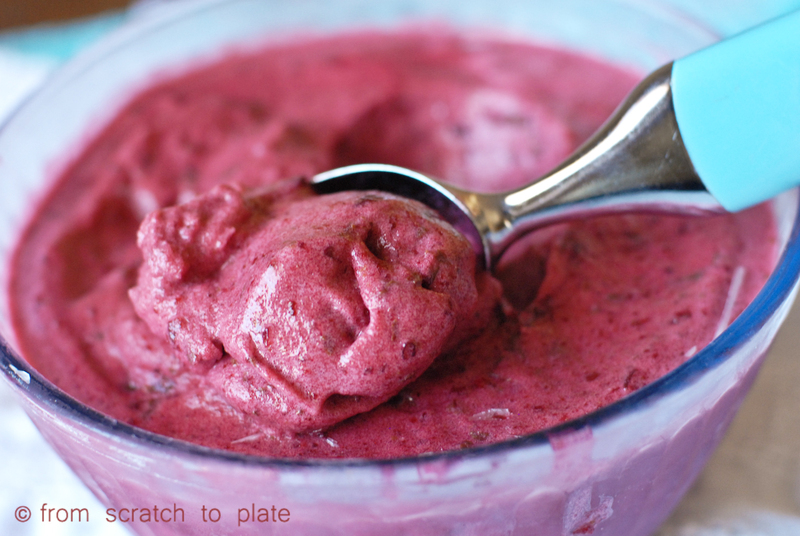 When the mixture is chilled, turn on your ice cream maker and pour in the cherry mixture. Make according to the directions for your ice cream maker. I have found that sorbet takes a little longer than ice cream. While the ice cream is churning, melt the chocolate chips and coconut oil in a small bowl in the microwave for 30 seconds. Remove and stir until smooth. When the sorbet is nice and thick and about done, use a spoon and drizzle the chocolate into the churning ice cream. Every once in a while, it may build up, and you may have to use the rubber scraper to stir it in. It just depends on the design of your ice cream maker. The idea is to pour in a thin stream, which will harden and break into flakes in your sorbet. You can accomplish this however it works best with your ice cream maker. You may or may not use all of the chocolate. Add as much as you would like. When finished, remove into a freezer-safe bowl, cover it and freeze until hard. Overnight is best, if you want it really hard. My kids didn’t mind the soft texture of ours one bit. 😉 (Ours chilled about 4 hours). REAL food alert: check for artificial flavors in your chocolate chips. ALLERGY alert: the only thing with dairy here is the chocolate. 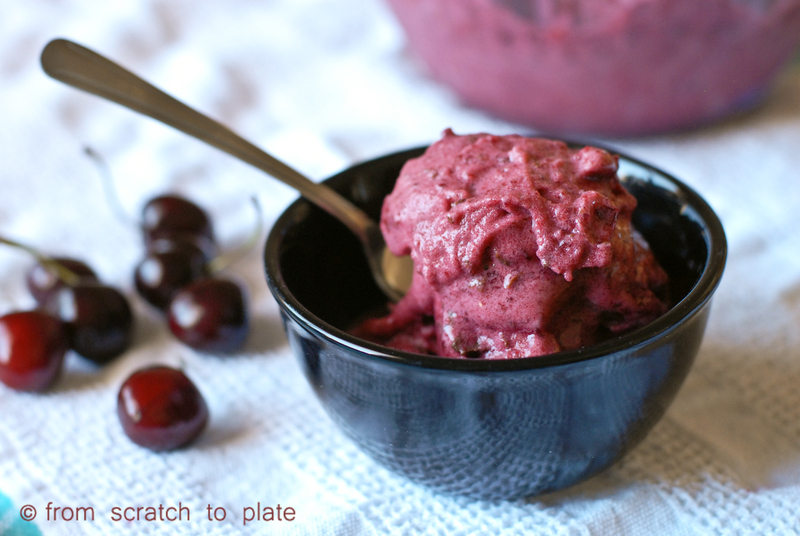 You can just make the cherry sorbet without the chocolate flakes, or use dairy-free chocolate. VEGGIE alert: to make this vegan: see above. I declare this to be the summer of adventure!!!! I have decided to buy a new type of produce and/or a new grain every time I go to the store. 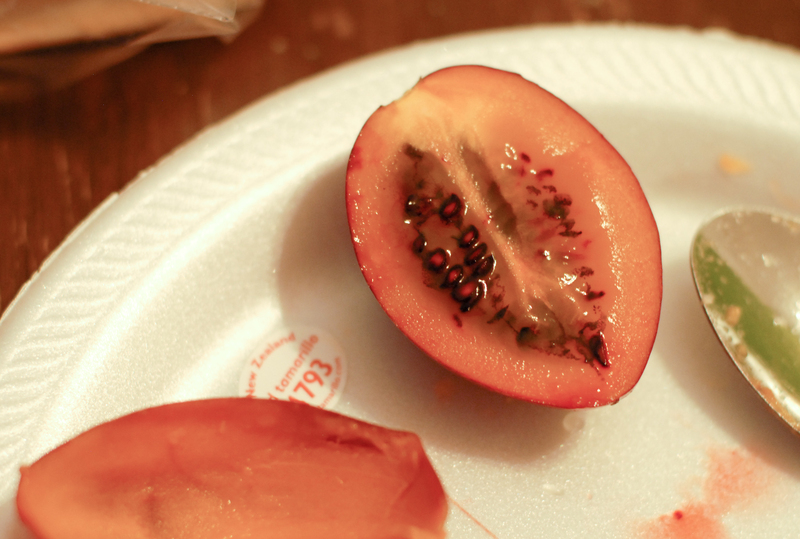 Our local grocery store had “tamarillos” which I had never seen before. They are a beautiful deep red, and look like a large oblong red plum. I was intrigued. It looks promising, eh? Well, it tasted nasty. Like poop-nasty. (Excuse my vulgarity). It was reeeeaaaaally sour, and had a sulfuric undertone. Two of my sons, who love sour things thought they were pretty good. In keeping with my adventurous goal, I got some black “forbidden” rice last time I went to the store. I was trying to figure out what to make it, and I thought it was about time I actually wrote down a curry recipe. When I get the hankering for curry, I just kinda wing it. It’s always roux-based, but everything else varies, sometimes I add coconut milk, sometimes I don’t. This time it turned out to be some of the best curry I’ve ever made, so I’m glad I wrote it down! The rice was great. It has the texture of brown rice, though a little chewier, and was a little earthier tasting than brown, but not noticeably different. One of my kids loved the ‘beetle rice’, once thought it was pretty good, and my squeamish one refused to eat it once brother said it looked like beetles. We also decided as a family we we prefer straight-up potato curry. We were all digging for the potatoes and ignoring the chicken (which is why the picture is mostly chicken…I took it the next day of the leftovers). You can add whatever you’d like. Sweet potatoes would be tasty, or carrots, firm tofu if you’re a tofu type person. 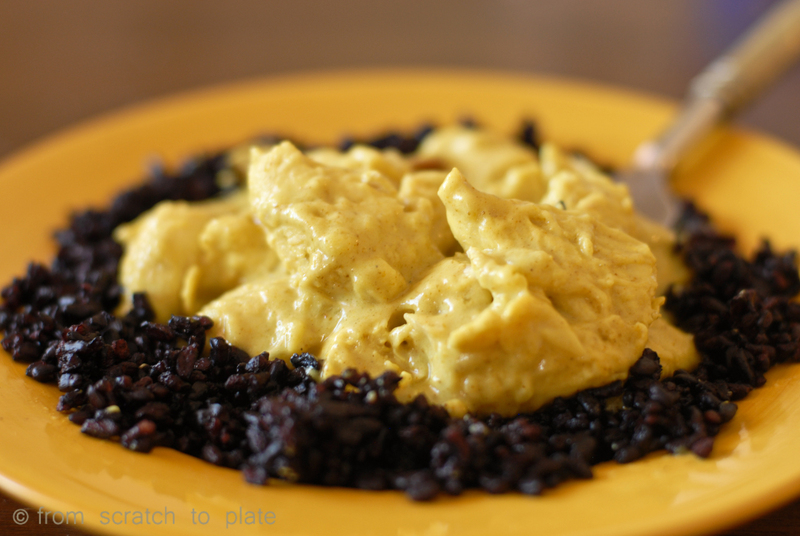 The amount of curry to add depends on your tastes, and the quality of your curry powder. 1 1/2 TBS was perfect for us, not too overwhelming for the kids, not too underwhelming for us. If you’re new to curry or not sure, start with 1 TBS, you can add more at the end if you need to. In a large pot, boil water. Add potatoes and cook until fork tender (when a fork inserted will slide in easily), but not falling apart. Remove and drain. Set aside. Cook your chicken if needed (I usually use leftover chicken for this, but you can cook your cubed chicken breast in a pan with a little water, covered, just until it is no longer pink in the middle and the juices run clear when you puncture it). In a large sauce pan, melt butter. Add onions and cook until soft. Add minced garlic and cook for one minute. Whisk in flour and curry powder. Cook while whisking for one minute. Add the chicken stock, 1/2 cup at a time, whisking well after each addition. Add coconut milk slowly, whisking continually. Add salt and whisk continually until sauce thickens. Add chicken and potatoes and cook and stir until chicken and potatoes are warm. Serve with rice. 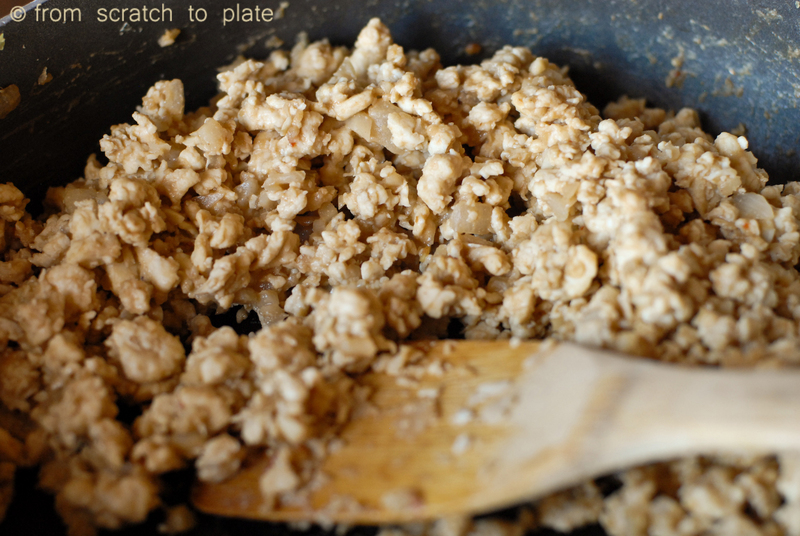 ALLERGEN alert: to make this dairy-free, use oil in place of the butter. To make this gluten-free, instead of making a roux, omit the flour, and after adding the stock and coconut milk, bring it to a simmer. 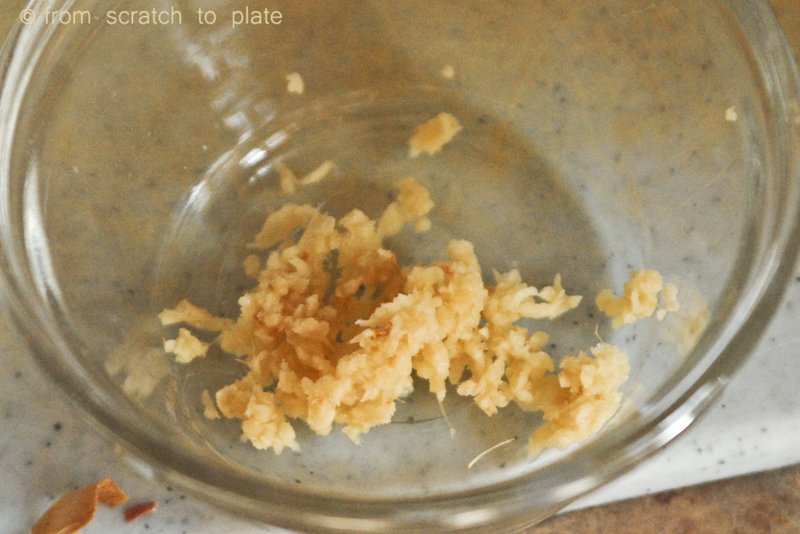 Dissolve 1 TBS cornstarch in 1 TBS cold water and add to the sauce. Stir until thick. SPECIAL DIETS alert: You can make this vegetarian or vegan by omitting the chicken and adding whatever veg you want. Bring water to a boil. Add rice and stir. Cover and lower heat to simmer. Simmer for 60-70 minutes, until all of the water is absorbed and rice is tender. I loooooooovvvvveeeee southern food. I lived in Florida for 18 months, and that’s the closest I’ve come to living in The South. But as I’ve been digging around in my family history, I’ve discovered that I come from strong Southern roots. That must be why a big plate of biscuits and gravy solves my worries and I feel like I can breathe better and life is brighter when I visit Tennessee. When I lived in Florida, I befriended an older woman who was raised in Georgia. Her family went back generations upon generations in Georgia. She made this recipe for me and I was hooked. 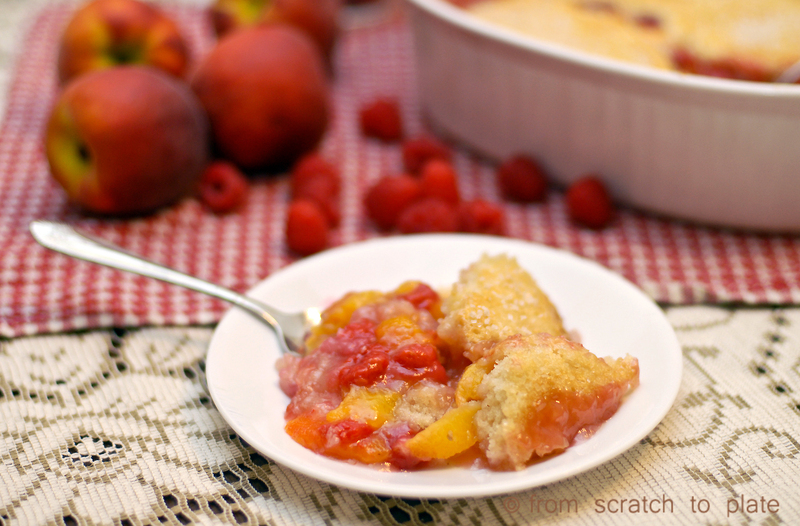 I had never had a peach dessert that I liked, I’m a fresh peach kind of gal, I’m not a fan of peach pie or peaches on ice cream, but I loved her recipe. Her recipe actually used canned peaches, so I adapted for fresh peaches, since we don’t consume corn syrup. On a whim, I decided to add fresh raspberries, and Oh. My. 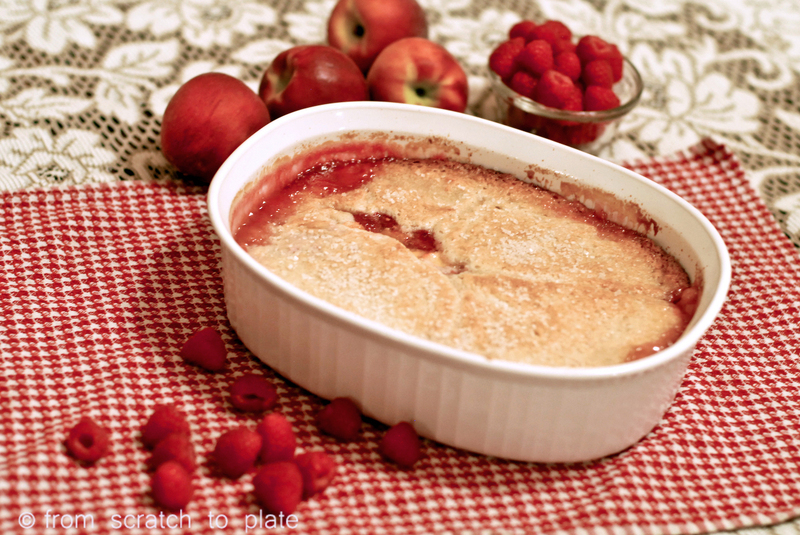 Goodness: this has become our family’s absolute favorite summer dessert. 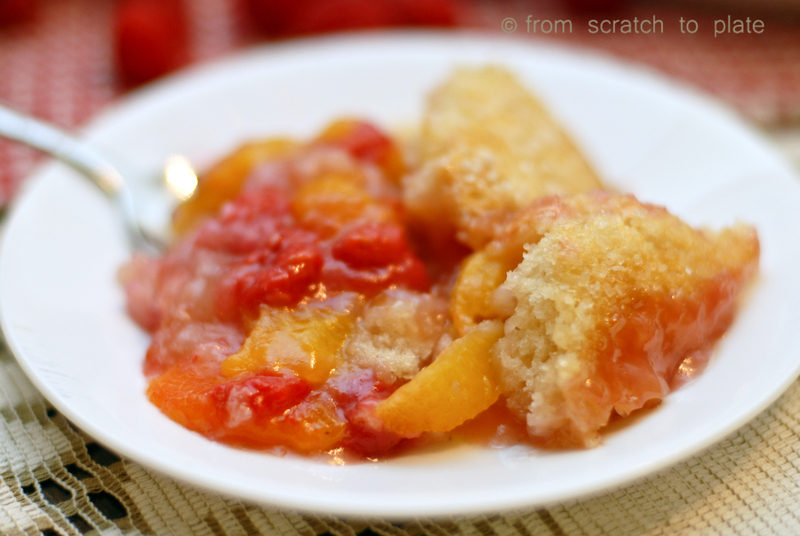 This is not the kind of cobbler with a crumby topping, It’s the Southern style type with a doughy cake-like goodness mixed amongst the sweet fruit. I sprinkle mine with sanding sugar. You can use any coarse sugar, like sugar-in-the-raw, or turbanido sugar. Sucanat might be a little too overwhelming. This is best served warm, within 30 minutes of baking. It tastes good cold for breakfast the next day, not that you’ll have any left. 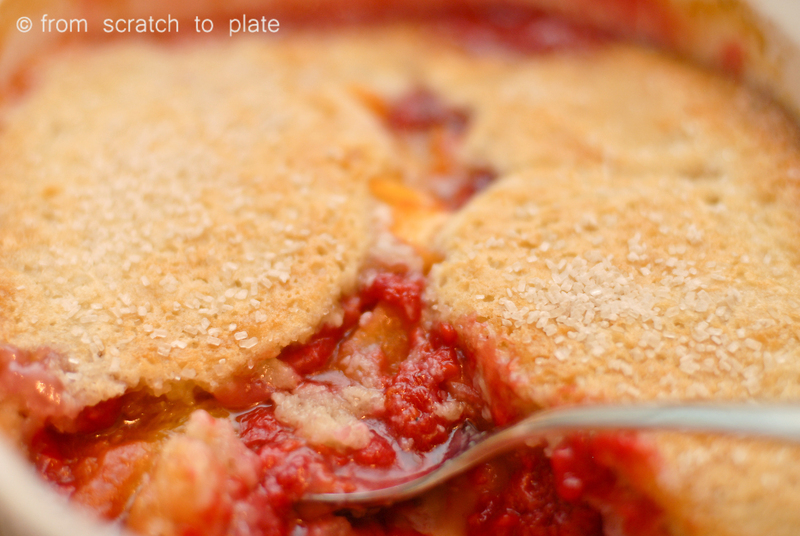 You could easily double this recipe and use a 9×13 pan if you are serving a crowd. In a bowl, combine peaches and lemon juice. Stir until peaches are coated. Add raspberries and 1/2 cup sugar and stir gently. Let sit at room temperature for 20-30 minutes, until you have at least a cup of natural juices. Preheat oven to 325 degrees. In a square baking dish, or a 2 qt dish, pour melted butter. In a mixing bowl, whisk together milk, flour, sugar and baking powder, just until mixed. Pour batter over melted butter. DO NOT STIR TOGETHER!!! 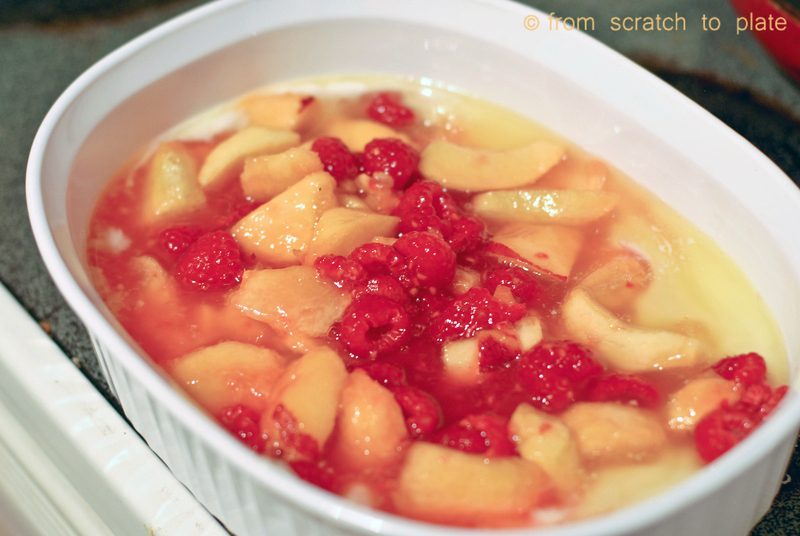 On top of batter, dump fruit and juices. DO NOT STIR TOGETHER!!! Seriously. Don’t do it. Bake in oven for 45-50 minutes, or until light brown. Sprinkle coarse sugar on top and bake an additional 10 minutes. Serve warm. ALLERGY alert: To make this dairy-free or vegan, sub an alternative milk. Almond milk or coconut milk would be tasty choices. Sub a dairy-free margarine or coconut oil for the butter. If using coconut oil, add 1/4 tsp of salt. For gluten-free, use a gluten-free flour mixture for baking. 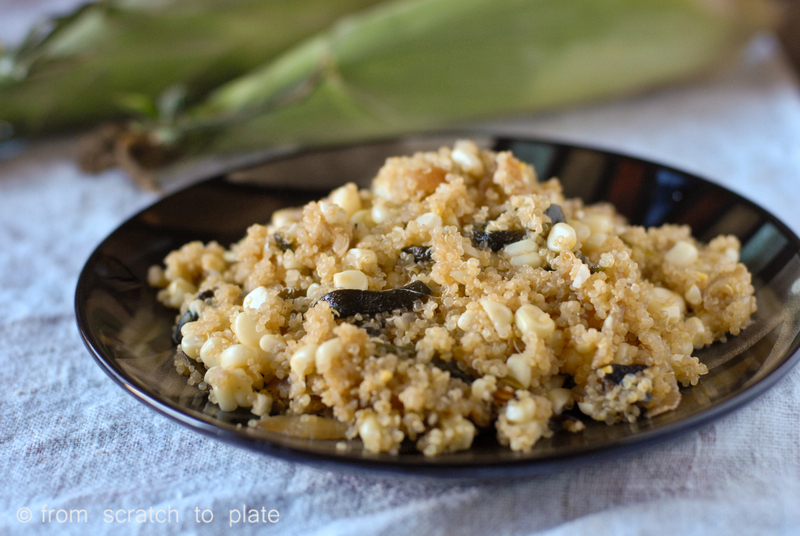 Okay, okay…this is very similar to my other corn quinoa recipe. But, I’m on a quinoa kick. If you’re curious why quinoa has become popular lately, I’ll give you a brief synopsis. 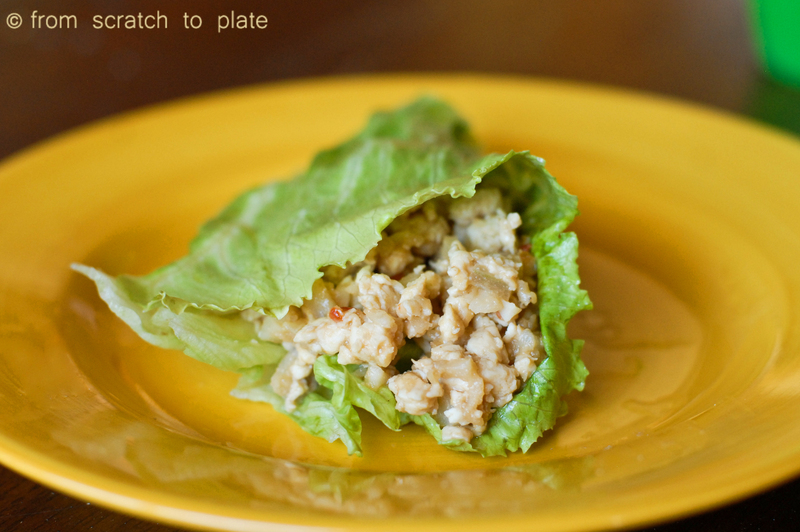 First, it has twice the protein of white rice. It also is a complete protein. That means it has all 9 amino acids the body needs. Typically, you find complete proteins in animal products (meat and dairy), or you need to eat a combo of foods to get all of the amino acids. Quinoa is a unique plant product that is a complete protein. That makes it popular amongst those who are moving to a more plant based diet (which is becoming a string movement, partially in thanks to a movie called Forks Over Knives, which I strongly suggest, especially if cancer runs in your family). While eating my other quinoa recipe, I said, “This would be really good with roasted chiles”. My husband agreed, and this dish was born. If you subscribe to my posts, you’ll notice that oven roasting veggies is a habit of mine. Pretty much anything tastes better roasted, and it’s any easy way to prep parts of a dish while making other preparations. In this dish, I kept with the southwestern flavor theme by adding a little cumin and browned sweet onions. I also added chicken as an option, for those not yet on board with meatless main dishes. Enjoy! Preheat oven to 350 degrees. 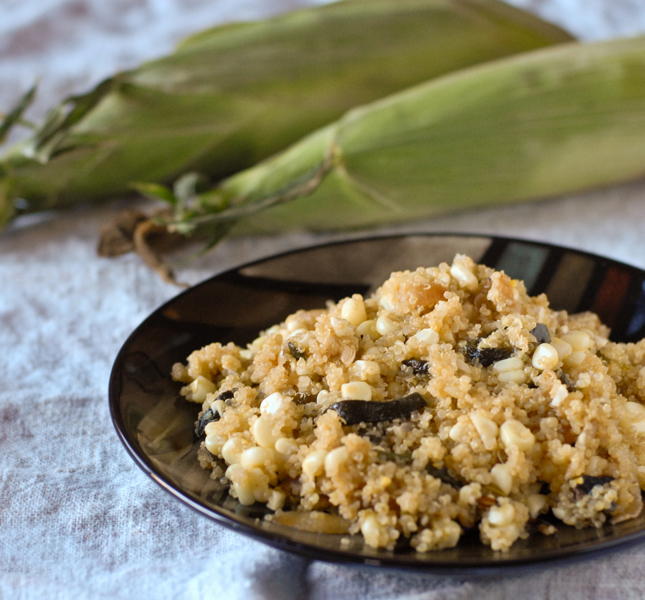 Place corn (still in the husk) and chile on a baking sheet in the preheated oven. Roast for 30 minutes. Turn chile once during roasting. Chile should be bubbled and black in most areas when done. Remove from oven and allow to cool. While they are roasting, heat olive oil in a frying pan. Add onion and cook until soft and brown. Remove from heat. In a pot, heat chicken stock over medium high heat. Add garlic and heat to boiling. Stir in quinoa and cumin. Cover and lower heat to low. Simmer for 15-25 minutes, or until quinoa is cooked and all of the liquid is absorbed. Wearing gloves, remove the blackened skin from the chile, remove and discard the seeds and slice the chile into thin strips. Remove the husks from the corn and cut the kernels from the cob. 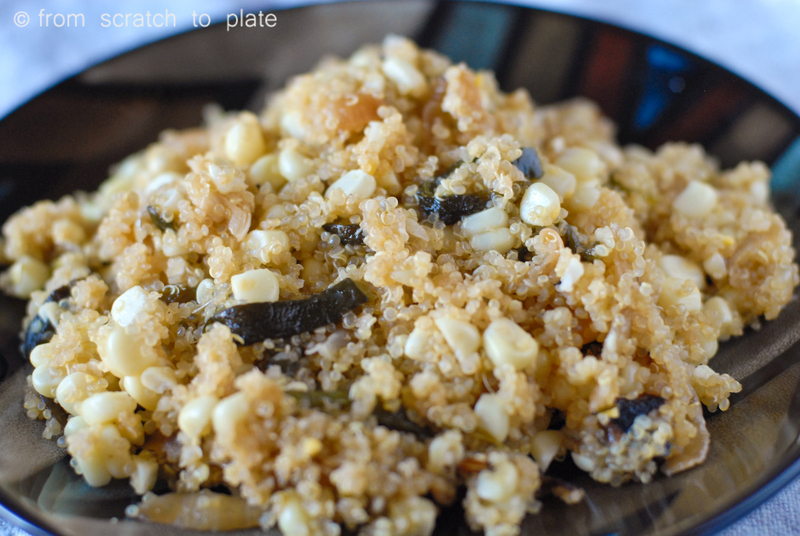 When quinoa is cooked, stir in the onion, the chile and the corn kernels. Add chicken if desired. Salt and pepper to taste, if needed. Serve warm.